Ladies, let us put it out there for you - how you look after your skin in your twenties, will show up on your face in your thirties. And it is as you approach the dirty thirty, that fine lines and age spots begin to appear. But worry not, ladies, for we’re here to help you and make sure that you look nothing but stunning, always! 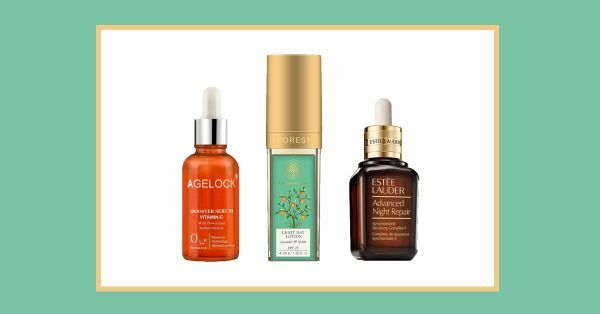 Here’s a list of some amazing skincare products, that will ensure your skin looks glowy, plump and young, no matter what your age. With our crazy busy lives and no time to pamper our skin, we tend to forget to moisturize and give our skin the hydration it needs. Luckily there are amazing Vitamin C-filled creams that not only hydrate, but also brighten your skin. This one by Natural Bath & Body facilitates in regeneration of skin cells that really help the appearance of your face. Whether hydrating or firming, a night cream before you go to bed is an absolute must. We prefer ones with an anti-wrinkle or retinol formula, as you can never be too prepared for wrinkles or aging. You may start to see slight lines and dark circles around your eyes as you get closer to thirty, that’s normal but you can do something about it. Start using a good eye cream that can help the sensitive skin around the eyes. This one by Himalaya is pocket-friendly and effective at keeping those crow’s feet at bay. You may not realise this on a regular basis, but if you look at your skin from your teenage years to your late 20s, you can actually see the effects of sun damage. We cannot stress enough on the importance of wearing sunscreen. But if you’re still not buying it, then at least try a BB cream like M.A.C’s Prep and Prime BB cream with SPF of 35 - it gives you coverage and protection! If you’re still using harsh cleansers with salicylic acid daily, you need to stop. Once or twice a week is fine, however, the older you get the more moisture you want to retain. And because heavy face washes can strip away essential oils and dehydrate skin, it’s best you steer clear of them. For daily use, opt for a gentle and naturally enriched face wash like Khadi’s aloe vera formula that really hydrates the skin, and keeps it looking fresh and clean. If you hate those makeup removers that really make your face feel dull and lifeless, then you can breathe easy. The Face Shop’s makeup remover is great to get rid of a day’s worth of makeup but it’s also really hydrating and leaves your skin feeling fresh, supple and clean. Just because it’s so important, we’re putting sunscreen on the list twice. This sheer and lightweight formula sits on your skin without making it feel sticky or heavy. Plus, this Neutrogena product has an SPF of 50+, definitely great to take on holiday to the beach or to the pool. A firming day cream, please! A good day cream will keep your skin supple and hydrated throughout the day. This is the key to youthful looking skin. Forest Essentials’ light day cream is great as it doesn’t feel like you’ve got anything on, but it locks in moisture. It is also enriched with jojoba, neroli, lavender and mulberry which is not only good for skin, but smells amazing too. We love using this on our hands too, so keep it handy in your office bag. Remember when those fruity lip balms were life when we were teenagers? Well, we’ve forgotten just how good they are for our lips. Matte lipsticks dry out and make your lips crusty, which is a big no-no. So, let’s start using our lip balms again - every night before going to bed is best as it works all night, making lips ready to take on the next day’s long-lasting lipstick. When it comes to a good night time repair cream, you can never be too young to start. As they say prevention is cure, and that couldn’t be more true than for your beauty routine. The Estee Lauder Advanced Night Repair serum is pricy but completely effective and worth it. Women have been using this product for decades and you can see the difference. Using these in your twenties is a must, ladies!